The following CEOE testing information provides a framework to help you identify correct answers on the actual exam. Use this background and paradigm to select the best CEOE practice test, study guide and pass your Oklahoma Teacher Certification Exam (CEOE). Here’s the Historical basis the Oklahoma Teacher Certification Exam (CEOE). The Oklahoma Legislature passed House Bill 1549 in 1995 that requires new educators seeking an entry level position in the education field have the necessary skills to meet state standards. CEOE tests include general education, subject matter knowledge, and knowledge of basic professional education. The Oklahoma Commission for Teacher Preparation (OCTP) works with a contracted test provider, the Evaluation Systems Evaluation Systems group of Pearson, to develop and administer the CEOE exam. See: How to Pass-the-CEOE — to see a “FREE CEOE Prep Book Guide To A Passing Score” (by Oklahoma teachers who passed). The CEOE test licensing program offers three designations: Oklahoma General Education Test (OGET), Oklahoma Professional Teaching Examination (OPTE), and Oklahoma Subject Area Tests (OSAT). The competencies required in each case were verified by Oklahoma educators and field tested. Be sure to use a quality CEOE Study Guide to ensure you pass the CEOE. Registration for your Oklahoma teacher certification examination can be done on the internet, by telephone or by mail for paper based tests. For computer based testing, registration must be done on the internet and has an additional charge of $35 for each test. Only a few CEOE test subjects are available in a computer based format such as business and early childhood education. The majority of the exams are only available in a paper based format. The cost of CEOE tests varies depending on which exam is selected. They range in price from $45 for an OSAT subset to $110 for Superintendent. Payment can be made using either VISA or MasterCard, or a debit or check card that has a VISA or MasterCard logo and doesn’t require a pin number. During the CEOE registration process applicants can select the manner in which they receive their score by choosing either e-mail or mail. If the registration was done by telephone the score will be sent by mail on published score date. Once you have completed the registration you will receive an admission ticket which will show the test selection, test time, test date and arrival time. CEOE exam registrations are done on a first come, first serve basis, so it is important to register early as seating is limited. Go to: CEOE Practice Test right now. On the day of the CEOE examination it is important to bring the admission ticket, several sharp No. 2 pencils for the paper based tests and one piece of government issued identification that has a photograph and signature such as drivers license or passport. Cell phones and other electronic devices are not permitted in the test area. There are two sessions available each CEOE test date. The first starts at 7:15 a.m. and finishes at 12:00 p.m. the second sessions starts at 12:30 p.m. and finishes at 5:15 p.m. The length of the test itself is four hours. The CEOE tests are designed to evaluate a candidate’s critical thinking, communication and computation skills. The OGET assesses general education knowledge and skills specifically critical thinking, communication and computation. The test has 100 multiple choice questions and 1 writing assignment. The OPTE focuses on the professional knowledge required at an entry level position. It includes 75 multiple choice questions and 3 written assignments. The OSAT evaluates a candidate’s subject matter knowledge. The tests include 80 multiple choice questions and 1 written response with the exception of Elementary Education, School Administrator tests, and Language tests which vary. The overall percentage assigned to CEOE multiple choice questions and written responses differs depending on the subject chosen. The majority of subjects assign multiple choice questions 85 percent of the final score while others weigh them for as little as 50 percent. The CEOE test score will indicate a pass or fail status and provide instructions on how to read the score report. A more detailed explanation of your test performance is available by logging into your account on the CEOE website and choosing “score reporting”. The final raw score is converted to a scaled score that ranges from 100 to 300. In order to pass a minimum of 240 is needed. Scores are calculated from the number of correct answers given. There are no deductions for incorrect CEOE test answers. Scores are criterion referenced which means that they must meet and established standard. Any fears or concerns people have about the exams are forever silenced the moment they pass! Start the process and register. An Oklahoma teaching license will last a lifetime. Go to: FREE CEOE Practice Test And Study Guide Reviews (By Real OK Teachers Who Passed) right now. "Why Not Pass The CEOE Now And Tell Your Own Success Story?" It actually covers the real CEOE! FREE CEOE practice questions (just like the exam). By OK licensed teachers who passed. 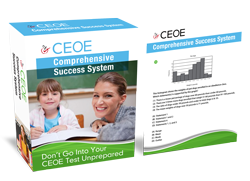 Get FREE CEOE Study Guide Now!